With the coming of July, it’s time to start celebrating Independence Day in the United States! Independence Day, also commonly referred to as “the Fourth of July”, celebrates the signing of the Declaration of Independence on July 4, 1776, and the separation of the 13 original colonies from Great Britain after the American Revolution. 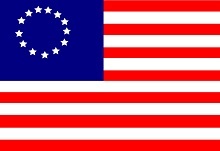 The Declaration of Independence outlined the birth of the United States of America as a free country, with Thomas Jefferson as its principal author, and was officially approved by the United States Congress on July 4th. On that day in the United States, Americans celebrate the values of freedom, liberty and justice. 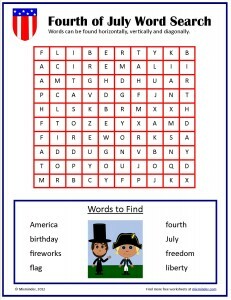 Here is a free word search worksheet for your children or students to complete. The words to be found within the word search all have something to do with the United States of America, and the values held by that country. While using this worksheet, why not take some time to talk with your children or students about American history, and what it means to be an American citizen? Thank you for sharing this at TBA and linking up! I look forward to seeing what you will share next! Thanks Fern – we appreciate it! I hope that you and yours have a terrific Fourth of July holiday.